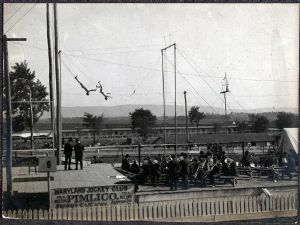 A daring pair on the trapeze at the Hagerstown Fair, 1905. A band played on a platform in the center of the race course. In the distance were the horse stables and South Mountain. An advertisement attached to the fence announced the Maryland Jockey Club's Fall Meeting at Pimlico.